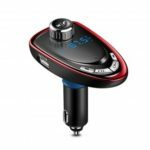 This AGETUNR T30 Bluetooth Car Kit FM Transmitter works as a Bluetooth receiver or car adapter, lets you stream music and calls directly from your Bluetooth device or music player to your car FM stereo system, which can make your driving more interesting and safer. 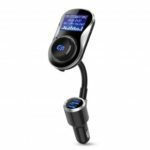 Large clear LCD screen, enables to show you the current voltage of the storage battery of your car, also show the name of songs or caller ID. Charging your devices with two universal USB ports in a fast speed, such as iPhone, Android smartphones, power bank and tablets, etc. 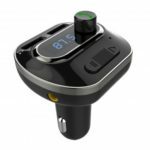 Built-in microphone allows you to make hands-free calls, reducing interference while driving. 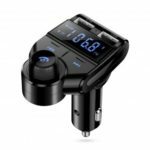 Supporting AUX output and input, work with Micro SD, TF card, USB flash drive or MP3, MP4 players via 3.5mm audio jack. Adopts advanced interference and CVC noise cancellation technology, provide you high clear sound and call quality. 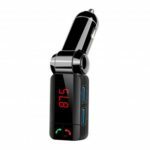 Just plug it in the car cigarette lighter, pair it with car radio, then connects your phone/MP3 player with this transmitter via Bluetooth/audio line. Suitable for most of the cars and trucks.